As a result of the change, the total number of GE executives reporting directly to Immelt rose to more than a dozen. In the 1990s, stories like GE’s seemed common, as companies grabbed headlines and earned kudos by claiming they were hacking away layers of middle management. Hype aside, it wasn’t apparent how widespread the phenomenon was or whether it really made any difference in how firms operated. Now, however, recent research by Wharton management professor Julie Wulf and Raghuram Rajan, a finance professor at the University of Chicago, has made the picture clearer. Wulf and Rajan examined the management structure and pay in 300 large U.S. companies and found that corporate hierarchies really are indeed getting flatter: More executives are reporting directly to the boss. In addition, the number of levels between CEOs and the lowest managers with profit-center responsibility has dropped. Companies, in short, are going from tall to flat. When they do, they are changing the way they compensate their managers. “Pay and long-term incentives are becoming more like a partnership,” says Wulf and Rajan’s paper, titled The Flattening Firm: Evidence from Panel Data on the Changing Nature of Corporate Hierarchies. At lower levels, managers of flatter firms earn less than at comparable hierarchical companies, but at higher levels they make more. Wulf and Rajan found that, from 1986 through 1999, the number of managers at these firms reporting directly to their CEOs rose from a median of 4 to 6. When Wulf and Rajan limited the analysis to just the 51 firms that appeared in the survey for all 14 years, the difference was even more pronounced; the median rose from 4 to 7. The two scholars tried to analyze whether their results reflected changes in the companies’ sizes or numbers of lines of business, rather than a new approach to management and fundamental changes in the way companies are run. Were the firms merely getting bigger, thus needing more high-level executives? No. On average, the number of employees at the core 51 firms actually dropped from 86,000 to 70,000. Were they doing mergers and acquisitions and thus stitching together management teams from two or more predecessors? Wulf and Rajan tossed out the ones that had done deals, and the results still held up. So what changed? “We find that the elimination of the intermediate position of chief operating officer accounts for a significant part – but certainly not all – of the increase in CEO reports,” the paper says. While COOs were being dumped, two other traditionally senior positions – chief financial officer and general counsel – rose in stature. In 1986, 67% of CFOs reported to their CEOs, compared with 88% in 1999, the paper says. The story for the general counsel was similar. Those changes still didn’t explain the whole increase in direct reports to the CEO. Much of the rest came from “traditionally more junior positions,” namely division managers, who began reporting directly to the boss, the paper said. 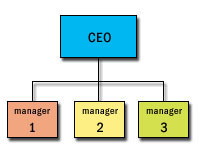 In addition, “the average depth at which the division manager is located below the CEO – the number of managers between the CEO and the division manager – has fallen, from 1.58 in 1986 to 1.15 in 1999,” the paper says. Another pair of terms – centralized vs. decentralized – often comes into play when discussing corporate structures. Centralized companies operate like the U.S. Army: Power and decisions stream down from the top. Decentralized ones try to push power down so that employees who deal with customers have authority to make decisions. Are the firms in the Wulf and Rajan study becoming more centralized or decentralized? Neither. Or maybe both. “On the one hand, the CEO is getting directly connected deeper down in the organization, a form of centralization. On the other hand, decision-making authority is being pushed further down, a form of decentralization,” the paper notes. A possible objection to Wulf and Rajan’s analysis is that it’s much ado about nothing. This line of thinking says formal hierarchies in companies don’t matter; informal relationships do. A CEO, for example, may make a division manager a direct report but not pay any more attention to that person than before. In firms where the CEO has more direct reports, division managers earn less in salary and bonus, but more in long-term incentive pay like stock options. Pay gets steeper in these flatter firms, too. That is, there is a greater difference in pay between upper- and lower-level managers. “All this suggests that as organizations are becoming flatter, and even as more responsibility is being hived off to lower levels, pay and incentives are becoming more like that in a partnership,” the paper says. Law firms are examples of flat organizations based on two primary levels: Partners are owners who make decisions while associates have less authority and lower pay, but large increases in pay upon promotion. “Salary and bonus levels at lower levels in flatter firms are lower than in comparable positions in a tall organization, but the pay differential is steeper to the top,” the paper says. Though Wulf and Rajan devote the bulk of their analysis to establishing the facts, they offer several possible explanations for the data.